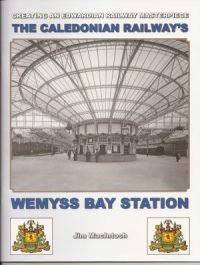 We have, with the aid of the Caledonian Railway Association, produced our own publication about the station, including a collection of historic photographs taken during its construction and opening, as well as interesting facts about the station. * If you are inquiring from abroad, please email us before you order, to obtain postage cost. Our own publication is now updated fro its 3rd reprint to include several new photographs and amended text describing various aspects of the recent refurbishment..
Be the first to review “Wemyss Bay Station Book” Click here to cancel reply.